Located just three miles east of Interstate 75 on Corkscrew Road in Estero sits Corkscrew Shores, a new 722-acre, master planned community. Residents will take pleasure in water sports on the community’s sparking 240-acre lake that features a kayak and canoe launch, a community fishing dock, and a series of walking and jogging trails. The grand clubhouse features a plethora of activities for homeowners, including a resort pool area, tennis, bocce ball, and pickleball courts, a fitness center, and a play field and pavilion. The clubhouse also offers a community gathering space, catering kitchen, conference room, activity room, fire pit, and the Captain’s Club outdoor bar and pavilion. 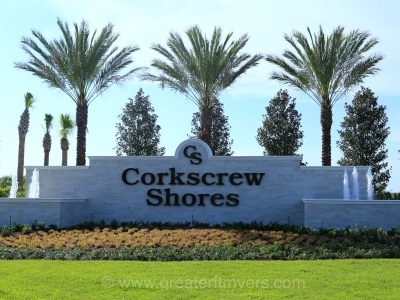 Corkscrew Shores home offerings include single family homes ranging from 1,289 to 4,283 square feet and from the mid $200’s to high $400’s.